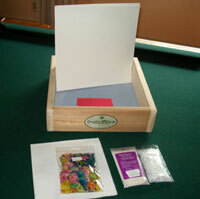 I am very excited to announce my new 12 X 12 Papermaking Kit for ALL you avid Scrapbookers!!! 12" x 12" kit designed and sold exclusively by Paper Alice. Now you can make your own handmade paper for your 12" x 12" scrapbooks! Plus Extras!-- I have also included a package of Acid Free Powder, a package of colored Angel Wings, and a package of Iridescent Flakes to make your pages POP and be acid free! My ever popular drying material will be included as well so your creations will be a breeze! Hello...I just found your site from a blogger friend. I've always been interested in making my own paper, so she pointed your site out to me. I see that you are from Ohio...Sweet! Maybe I can make it to one of your classes! Love your Blog, and your web site!